Melody Trumpet is a fictional story about a small girl with a big secret. From the moment Melody Trumpet is born, the world expects her to be a musical genius, gifted beyond any other. After all, she is the one and only child of the extraordinarily talented, amazingly incredible, musical superstar parents, Mr and Mrs Trumpet. 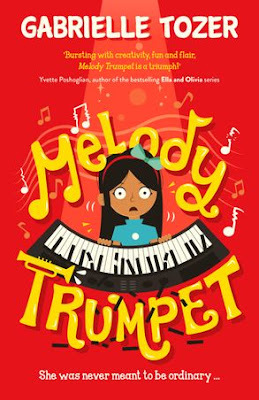 Unfortunately for Melody, her self-obsessed, world-famous parents, with legions of adoring fans, have a reputation to uphold, and when Melody's first cries are anything but melodious, the Trumpets have no intention of letting a little truth get in the way of their extraordinary fame and fortune. Author Gabrielle Tozer has developed a cast of characters with distinct and quirky personalities set within a musical microcosm. So begins the life of Melody Trumpet, hidden away in Trumpet Manor, and schooled in secret, in a vain attempt to, somehow, cure Melody of her apparent total lack of musical talent. Fortunately, Melody finally meets some people who begin to see her for the unique and wonderful person she truly is. Along the way, Melody learns to trust in her own abilities and her newly-formed friendships, discovering that love and family can be found in the most unlikely places.